This recipe for chicken stock differs from the classic method I learned for making stock during my time at the Ecole Ferrandi in Paris. At Ferrandi, all the vegetables were carefully peeled and dices and the herbs and spices tied into a boquet garni using cheesecloth. However, I find that using the skins and peels adds an early richness that I enjoy. And frankly, if you are going to going to strain the stock, why bother to make a bouquet garni? 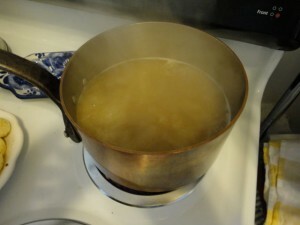 I have included the recipe for both white and brown chicken stock, (called fond blond or fond brun in French). The two are used in different recipes depending on the desired finished effect. The brown is great in rustic, full-flavored recipes and the white for delicate consommes and lighter sauces. 1. Scrub the carrots and trim the stem end. Chop roughly. Wash and trim the celery stalks; chop roughly. Remove the root end from the onions, then chop roughly with their skin. Crush the garlic cloves with their skins. Wash the leek top carefully and chop roughly. 2. Put the chicken bones in a large stock pan. Add the vegetables, bay leaves, orange peel, spices and herbs. Add enough cold water to cover the bones and vegetables by2 inches. 3. Bring the pot to a boil over high heat. Carefully skim off any foamy scum that rises to the top. Reduce the heat to very low simmer. The stock should be just barely moving from time to time. 4. Cover loosely with a lid. Cook the stock for at least 3 hours; 6 hours or overnight is better. During this time. if the water level reduces, refill with more cold water. 5. Strain the stock through a fine mesh strainer and discard the solids (it makes good compost!). Cool the stock in an ice bath or in the refrigerator. 6. When the stock is cool, remove any solid fat from the top. This can be saved and used for sauteing or added to soups for extra richness. 7. The stock may be stored in a cold refrigerator for about 5 days. It may also be frozen in smaller containers to be used as needed. 8. Scrub the carrots and trim the stem end. Wash and trim the celery stalks. Chop roughly. Halve the carrots. Remove the root end from the onions, then quarter. Crush the garlic cloves with their skins. Wash the leek top carefully and chop roughly. 9. Put the chicken bones and the vegetables into a shallow roasting pan. Drizzle with a bit of vegetable oil and toss well. Roast in a 400 deg F oven, stirring every 10 minutes or so, until the bones and vegetables are deeply colored. This should take about 40 minutes. 10. Remove the pan from the oven. Using a slotted skimmer, transfer the bones and vegetables to a large stock pot. Drain any fat from the pan. 11. Put the pan on a hot burner, add 2 cups of water and bring to a boil. Carefully scrape up all the caramelized bits from the pan. Pour these with the water into the stock pot. 12. Add the bay leaves, orange peel, spices and herbs to the pot. Add enough cold water to cover the bones and vegetables by two inches. 13. Proceed as for blond chicken stock. This entry was posted in Pantry and tagged chicken, Kitchen basics, poultry. Bookmark the permalink.